I know alot of you will say you don’t have time, but honestly, homemade crackers are really easy to make and only take 7 minutes to bake . You can get creative too and use different types of cookie cutters and additional types of seeds or flours, for example buckwheat flour is a nice alternative. If you’re really running on a fast track, you can mix the flours and seeds and store in a ziplock bag, or air tight container until you are ready to make them. Try different cookie cutters and don’t get stressed out if they are not perfect , they taste good and they are nutritious. They keep well in the freezer too! Mix all the dry ingredients in a large bowl, then add the oil and water and mix until it forms a dough. Form into a ball and cover it with the bowl. Let it rest for 15 minutes. Preheat the oven to 450°. Divide the dough into three or four pieces, then one at a time roll them out thinly on a floured surface, and cut into shapes with either a pizza cutter or cookie cutter. Place on a parchment paper lined baking sheet and cook for 7 minutes or until lightly browned. * Since these crackers have no preservatives, they will go soft quickly so they are best eaten same day or kept for a few days in a paper bag , and they also keep well in the freezer. 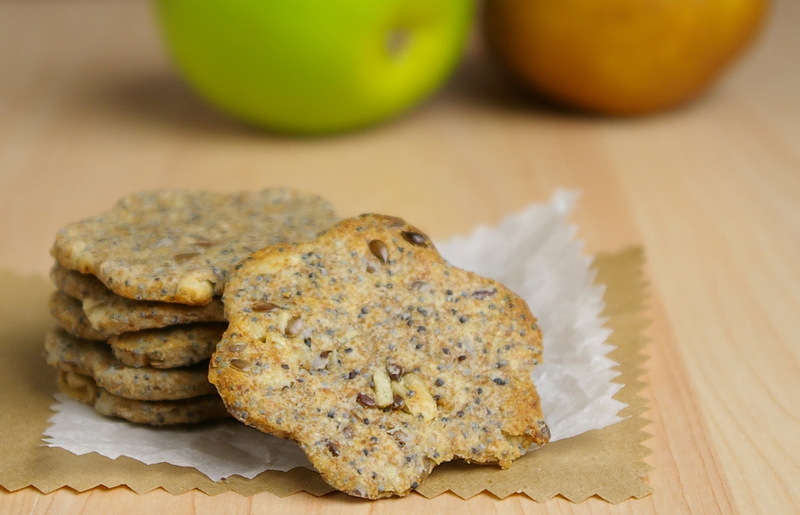 This entry was posted in Bread, Home and tagged Crackers, Dough, Flax Seeds, Flour, homemade, Poppy seed, poppyseed, rye flour, Sunflower Seeds, Whole wheat flour by Ginger Smoothy and Otto Pilot. Bookmark the permalink.